Here it is, husband's own recipe for braised pork. It is very much like the man himself, simple and not in the least fussy. Others may put five-spice powder, dried orange peel, cinnamon, etc but none of that for him. The only concession he made was the addition of dried chillies a few years ago, after I commented that my family sometimes added this to make the dish less one-dimensional. Usually he makes this dish with half the quantity but like all long-cooked meat dishes, it improves with age; last Sunday he decided to make enough so that we can eat the leftovers during the week. If you are making it for the first time, try halving the ingredients. The dried ingredients are also optional, feel free to add whatever you fancy or have available in the pantry. We happened to visit the dried goods wholesaler on Saturday so there was plenty of dried goods to play around with, but most of the time it is made with just pork and mushrooms. 1.8 kg pork belly, cut into chunks - fresh chilled pork from the wet market makes a superior product compared to the frozen version, and the butcher should be able to recommend a suitable cut. 3 pieces tau-kan / tau kee (dried bean sticks), soaked 5 minutes only, cut into finger-length pieces. Marinate pork with soya sauce, garlic and dried chillies. Overnight if possible, otherwise a minimum of 2 hours . Heat oil in wok and quickly sear the pork. 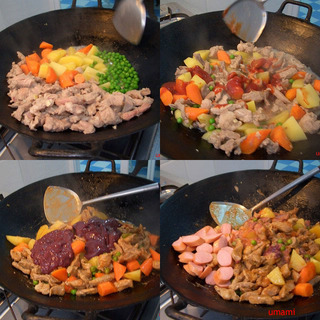 Then and add prepared dried ingredients (except tau kee) to mix. Transfer to a cooking pot, add the marinade liquid and top up with boiled water until the meat is completely submerged. Add the second portion of soya sauce. Bring to a boil and lower heat to simmering point. Let it cook a further 2-2.5 hours, stirring occasionally. 45 minutes before end of cooking time add the tau kee, but do not stir too much or it will unfurl and make the dish look very messy. At the end of cooking, add a little rock sugar to taste. 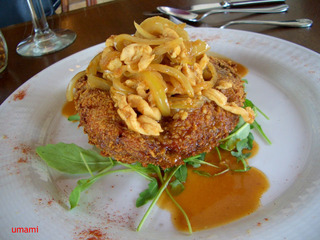 A 20-cent nugget is usually enough to mellow the edge of the soy and make the gravy taste smoother. 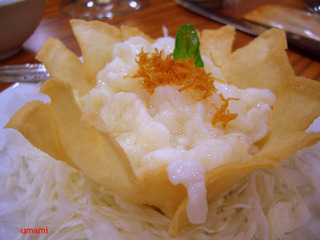 Serve with rice, congee or mix with noodles. I imagine it will taste good in a sandwich too. My friend slurp wanted to know what they look like. Another Jacques Pepin inspiration. 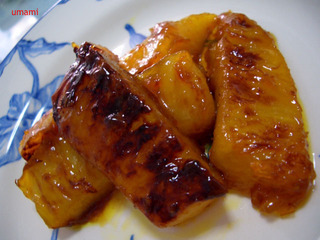 Pineapple slices laid neatly in a pan, dot with butter and brown sugar and splash with orange juice. Let the orange juice thicken, and resist turning the pineapple to see if they have browned yet. Finish with cointreau, can flambee if you like, not if you don't. Then, voila! pineapple candy. From L to R: Fresh polenta, corned beef toasties, Christmas Lima Bean stew with Prawns and Courgettes, Pineapple Pear Salad. The idea for our past, rather extravagant, Sunday brunch menu started with a sudden fancy for corned beef toasties. The good ladies at the Church of Sacred Heart sell them at $1.50 a piece, and if we are disciplined enough to wake up early we would have snagged ourselves some. However, knowing ourselves as lapsed Catholics whose attendance at church is at best sporadic, we decided to make our own. And cook a few other things which may go well with the toasties. Like fresh polenta, recipe courtesy of Jacques Pepin. Late on Saturday night the two of us watched in fascination as he made polenta with fresh corn. Prior to this I had never liked polenta because of too many bland and dense restaurant versions. It really is, as Jacques promised in his series Fast Food My Way, very simple and fast. The whole process took less than 15 minutes, but I let the corn stay on the pan a little longer so they get a bit of a brown crust. Only problem was, there wasn't much yield from a pair of corn and everyone got only about a tablespoonful each. Next time we will blitz a half dozen. Because the toasties had beef, I didn't fancy making anything else with meat. 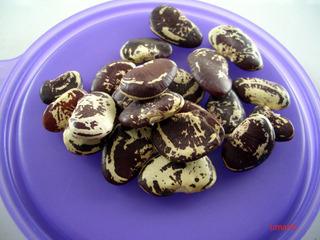 Instead I cooked some of the Christmas Lima beans that we bought in San Francisco last year. Bacon would improve my beans, but I was set on courgettes to accompany them and really, there isn't good bacon to be found in the vicinity of Tekka Market and we didn't have much time to hop from market to market, so in the end I added some prawn stock and white wine instead. The bean stew turned out fine, the mellow chestnut-tiness of the beans grabbed all the attention while the supporting cast of prawns and courgette lightened the rusticity somewhat. For added zip, I stirred in a dollop of parsley anchovy sauce with each serving. To finish, I thought of a fruit salad. Because Jacques Pepin had advocated making fruit salad with a dressing of apricot jam and almonds. I didn't have any apricot jam in my fridge, but there is always a respectable collection of marmalade inside. So we paired marmalade with honey and mint and the salad was a hit. Almonds, nah, none available at home. To drink, husband opened a bottle of French chardonnay. Some of it went into the bean stew too. I used to dislike Chardonnay because of the oakiness but the Macon Burgy 2001 was most un-oaky. It's light crisp honeyed character was a good match for our hearty brunch. Sweat the onions and chilli in a non-stick pan until soft. Add corned beef and cook, stirring only occasionally, till some of the beef develops a darker colour. Make sandwiches with the beef. Toast sandwiches. Use a knife to slice the kernels off the cob. Place all the corn in a blender with a pinch of seasalt. Blend till fine. Heat some butter in a non-stick pan and cook the corn. Keep stirring till the corn thickens, about 5 minutes. At this point you can either add more butter and serve or let it stay in the pan till it browns. Take a heavy bottom saucepan- I used the Staub cocotte that I won at the food bloggers lunch. Sweat the onions, garlic and carrot in olive oil until soft. Add beans and enough water to cover. Bring to boil and lower the heat until everything comes to a constant gentle simmer. Let it cook for 2-3 hours, stirring only occasionally. In the meantime, steam the prawns. Remove the shell and head. Reserve the cooking liquid. Keep the prawns aside. When the beans are tender, add the wine and prawn stock. Bring to the boil, add the courgettes and cook till the courgettes soften slightly. Return prawns to pot and serve. This sauce is my standby item for brightening many fish and poultry dishes. It tastes amazing, trust me. 2 pieces anchovies in oil. Place parsley and scallions in a mortar. Grind together with anchovies until everything is amalgamated. Add sea-salt to taste, olive oil to smoothen if necessary. Finish with a squirt of lemon juice. Mix marmalade, honey, mint leaves and golden raisins together. Add fruits. Serve. Ben & Jerry's is in Singapore. And I don't mean at the zoo location. Now at United Sq. More outlets to open at Suntec City & Great World City. Husband makes a damn good version of tau-yu bak-belly pork, dried squid, dried mushroom and dried oyster braised in garlicky soya sauce. I loved this dish so much that when 4th sister asked me for a recipe for braised pork, I sent her the recipe. But husband wrote down 2 cups of dark soy sauce instead of 2 tablespoons in 2 cups water. A very angry 4th sister wrote back to scold me because her dish turned out bitter and inedible; her pot was also burnt from the boiling soy sauce. Soy sauce is like that. You don't need a lot. 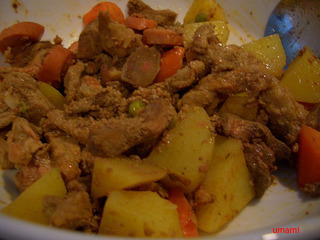 2 tablespoons to 2 cups of water is sufficient to make a pot of braised meat. You don't even need the special or premium varieties, last week we made some using ordinary grade Tai Hua version and the taste was not much degraded. Most of the time, dark soy sauce needs to be applied in small amounts, e.g. 2-3 teaspoon, until the dish takes on a rich brown colour. Light soy sauce I would use with similar restraint, and I never boil light soy because my mother used to tell me it makes the dish sour. Which is why when I see those ang-moh cooks on telly use soy sauce I always cringe and feel like screaming. Jamie Oliver was making gyoza on telly the other night; for the dip the base of 90% soy sauce was so overwhelming he had to add a whole lot more vinegar to balance it out. Same thing happened when these telly cooks make an 'Asian' marinade, the first thing they do is splash the soy sauce like they are making cocktails, so heavy handed. Wish someone would tell them to cut it down by at least half, the food will taste more natural and balanced. This kind of condiment abuse is not only limited to soy sauce. 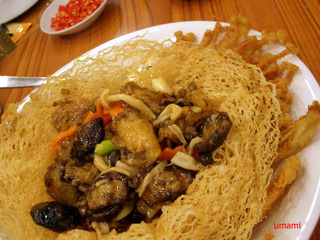 Oyster sauce is another victim, like soy, this too should be used judiciously otherwise every dish will taste the same. Lately I've observed similar infractions with fish sauces. We probably also make the same mistakes with Western ingredients. Balsamic vinegar for example, which Mummy once mistook for Italian soy sauce, gets sloshed about a lot. And herbs. I know when I make a lamb or beef roast, I tend to scatter the rosemary or thyme too liberally because I haven't a clue what I will do with the rest of the bunch which was purchased at some expense and therefore reluctant to waste. What will happen if we don't use these seasonings? It won't be too bad I guess. I am in the process of switching Mimi and Rufus from kibbles to a more home-cooked-food (HCF) diet because Mimi is such a food-fusspot. Their diet is now usually protein (lamb, salmon, garoupa, chicken, pork or egg) steamed, panfried or lightly braised with two types of vegetables from a rotating selection of whatever is available in the fridge.The only seasonings used are half-cloves of garlic and plenty of parsley, to all this I would also add some seameal supplements which may contribute some flavours. Their meals tastes great and they always lick their bowls clean. I would happily eat the same, well, minus the seameal of course. On 1 September 2005 local cable TV subscribers got the unusual bonus of 5 new channels. My favourite of the lot are the Asia Food Channel or AFC (69) and BBC Prime (76). Both come at an opportune time, because Discovery Living and Travel (16) is getting very commercialised- poor Nigella Lawson, Billy Kwong, Floyd and Jamie Oliver have to take turns occupying the daily two hour slots while the rest of the time they show a silly woman checking out hotel rooms. Both AFC and BBC Prime provide excellent food-based content. OK, Fawlty Towers is not exactly a food show, but Manuel cooks right? And all the exciting stuff always happens to Basil at breakfast. BBC Prime shows Delia Smith, Ready Steady Cook and Rick Stein. AFC is our local, soon to be regional, version of the Americans' Food Network. Some of the programmes are repeats of Makansutra and Yummy King which don't make such riveting watching the second time round. Chef Wan gets featured a lot but he is a bit grating at times. More interesting are the programmes on Korean dishes, I am still waiting to catch the segment on the egg- guillotine device that turns a tray of eggs into a tray of Madonna bra cups. The River Cottage series with back-to-basics chef Hugh Fearnley-Whittingstall also fascinates me with his vegetable contests and pigeon shootings. But what really makes me and husband take note and ignore the other task that we are usually doing when we watch telly is Jacques Pepin and his Fast Food My Way series. So he was showing how to make duck a la orange, you know, sear the duck breast in a hot pan, let it rest, etc and the very next day my friends came round bearing vacuum-wrapped confit de canard. I felt very authoritative supervising the cooking of the meat. And husband, well, he was so inspired by this master chef Jacques he actually made something from the programme. The dish was a grapefruit jelly dessert. Only we were out of grapefruit but the wholesaler had recently delivered a big box of Valencia oranges, all sweet and juicy. 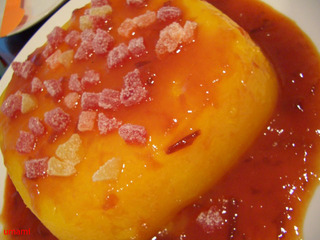 Thus the grapefruit jelly became orange jelly. Husband pressed the juice of 9 oranges and combined it with about 2 packets of gelatin powder to make the jelly. I helped by grating some orange zest with the Microplane zester I had purchased from eBay a few weeks ago. We went to bed and hoped the jelly will set. It did, beautifully. Husband made a sauce by boiling down and reducing orange juice, Cointreau and the remains of the June Taylor Pluot and Lavender Conserve we brought back from San Francisco last year. For decoration I chopped and sprinkled some Marks and Spencer's Juicy Fruit candies. A simple, healthy and very refreshing dessert. For adults that is, the kids preferred the candies. Elena continues to surprise us with her excellent Filipino cooking. I was having friends over for Sunday lunch but nursing a stuffy head cold and and coping with all sorts of little crisis at work had left me too tired to bother about cooking, so I asked her for help. Into the wok went some chopped garlic and shallots. Then the pork gets stirred about. Halfway through she made space for carrots, then potatoes. When the potatoes are tender, green peas went in. I was put to work squeezing ketchup from a bottle. Curiouser and curiouser. The ketchup turned the pork pink. Then the liver went in. Half was cut into bite sized chunks, the other half I had whizzed in the blender to simulate the liver paste she wanted. The hot dogs were added in last and the heat turned off so the liver would not overcook. Everyone liked this Pork Menudo, and I quite forgot to take a picture until we had finished most of it. The flavours were multi-layered and robust with plenty of textural contrasts in the pork slices, hot dog, liver and vegetables. The pork was not sour as I expected; the lime might have been used to counteract any possible 'porkiness' but it also brought out the natural sweetness of the meat. The minced liver added characteristic depth and earthiness, this is a rich celebratory dish best enjoyed with friends and a few glasses of red wine.